"Catch me being good and reward me." Bad habits can develop in any dog. Still, the unique mix of intelligence and working drive possessed by German shepherds makes them more susceptible than other breeds to changed patterns of behavior. With training and consistency, you can break bad habits in your shepherd. Investigate the cause of the behavior -- look for its hidden reward. Dogs always do what works; your German shepherd is being rewarded in some way for his bad habits. A dog that counter-surfs, for example, is rewarded by the scraps of food he finds. If you look hard enough, you can find a reason for the bad habit. Remove the reward, if possible. If your dog digs through the trash, for instance, move the trash can up high on a shelf or place a lid on it. If he barks out the window, shut the blinds. If he jumps on visitors, ask your visitors to ignore him until he sits politely. Consistency is key here; everyone who interacts with the dog must maintain the same set of rules. 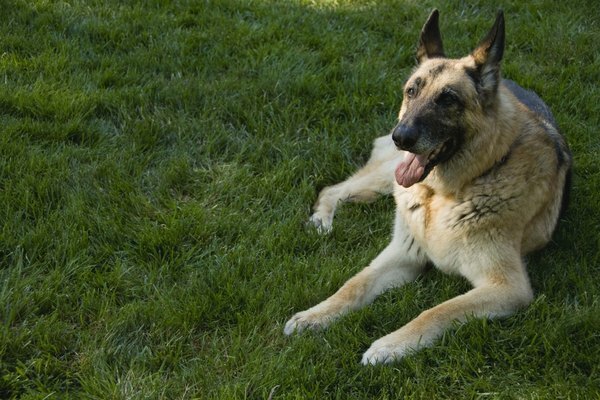 Provide your German shepherd with at least 45 minutes of exercise every day. She’s bred to work hard and solve problems, and if left with nothing to do she will often find her own challenges -- which may not be desirable. Enroll your German shepherd in a group training class to provide him with an outlet for his energy and pent-up frustrations. He’ll also benefit from the socialization. Give your German shepherd small treats when you catch him doing something right. The more you let him know which behaviors you like, the better his conduct will become. You can also reward him with affection in lieu of food. Both positive and negative attention reward for your dog’s bad behavior. If your German shepherd knows he can get your attention by doing something wrong and he’s not being rewarded in other ways, he’ll go for it. Never reprimand your dog with physical force. This only builds fear of you and does not solve the problem.